This year, we offer you an alternative to the standard Pugsley. The Neck Romancer Pugsley is the stealth bomber in our fleet. The frame and fork are black with subtle black and gray decals. The rims are black. The spokes are black. Almost everything is black. But this bike isn’t just an alternate color version of the standard Pugsley. 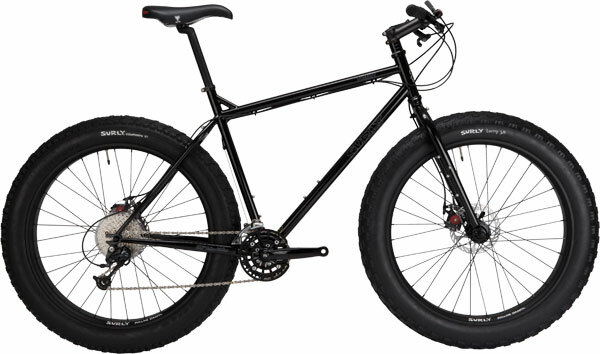 Where the standard Pugsley sports 65mm-wide Large Marge double-wall rims, the Neck Romancer utilizes our 82mm-wide single-wall Rolling Darryl rims to expand its tire footprint, increasing its traction and all-terrain floatation. The increase in rim width puts the tire closer to the chain, so to avoid chain rub we spec’d this bike with our MWOD rings on a Mr. Whirly crankset. This provides all the chain/tire clearance necessary while retaining low- and mid-range gearing for crawling through the sticky and flying under the radar. The Neck Romancer Pug is available as a complete bike (with a Moonlander fork) and as a frame, no fork. Choose the right one for you from our fat bike fork offerings…or pick something else (there are a few non-Surly options out there) and build up your ride to suit your specific needs.